Since 2008, World Sickle Cell Awareness Day has been held annually, in order to help increase public knowledge and raise awareness of Sickle Cell Disease (SCD) and the struggles sufferers and their families go through. The date was chosen to commemorate the day on which a resolution was officially adopted by the General Assembly of the United Nations, recognizing SCD as a public health concern. 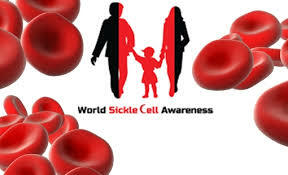 SCD affects millions of people around the world, including both adults and children. It is a potentially fatal disease and, according to the World Health Organization (WHO), is one of the main causes of premature death amongst children under the age of five in various African countries. The World Health Organization (WHO) has started work to promote a world wide agenda to address hemoglobin dysfunctions. Some health groups dedicated to SCD treatment or support hold special educational celebrations. However, even if you cannot attend one, why not spend the day researching the illness, learning about the signs and symptoms and increasing your understanding of its global impact.